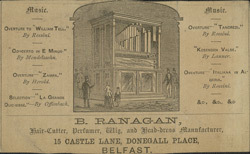 This leaflet lists the prices charged by B. Ranagan, a Belfast hairdresser in the 19th century. Although fashions changed continually throughout the 19th century, hairstyles changed to a lesser extent. Men’s hair was usually cut either just below or just above the collar, working men shaved just once a week on Saturday nights, and to have a moustache indicated that one was a military man. Women’s hair was always long and often decorated with ribbons and flowers. It was worn up during the evening and for the daytime was covered by a hat or bonnet. One way to date old photographs is to look at women’s hair. If the ears are covered up it is likely to date from before the 1860s.